By buying this product you'll earn up to 2099 Rewards points. It's a smallish English country town, with little to differentiate it from other towns along the train line you've been riding today. Except for this: a huge mixed-architecture cathedral plunked smack in the middle of the park that occupies much of the downtown. And it's huge! You want a photograph that will give viewers a sense of the imposing nature of this structure, but your kit lens just won't do the job. Time for this 14mm f/2.8 L-series Canon lens to go to work and show you what it's made of. Getting the outside of an entire medieval cathedral to fill a frame is just one of this lens's many capabilities. Interiors of houses will present fewer challenges because of the extra scope. Plus they won't necessarily need a flash unit, because the f/2.8 maximum aperture is so good at making great images by maximizing the light you have. It's an L series lens, so it's designed for durability and weather-resistance. And the optical elements are crafted to Canon's usual impeccable standards: two aspherical and two ultra-low-dispersion elements help your wide-angle images to be as sharp and clear as they can be. Overview: The Canon EF14mm f/2.8L II USM lens is a high-performance ultra-wide angle lens for use with Canon EOS cameras. The lens features a built-in Ultrasonic Motor (USM) for quick and quiet autofocusing. The lens is constructed of 14 elements in 11 groups, including aspherical and UD (ultra-low dispersion) elements for excellent imaging capability. Focus Modes: The EF14mm lens is equipped with a two-way switch for setting the Focus Mode. You can choose from AF (auto focus) or MF (manual focus). In Manual Focus mode, you can focus on your subject by turning the focus ring. The focusing ring always works, regardless of the focus mode. Gelatin Filter Holder: The lens has a gelatin filter holder at the rear of the lens. You will need to cut the gelatin filter to fit within the white frames (1-3/16" square), then insert the gelatin filter into the filter holder. The lens is not compatible with screw-on lens filters. Lens Hood: The built-in lens hood cuts out unwanted light and protects the lens from rain, snow, and dust. Distance Scale: The distance scale gives you an indication of the focal distance of the lens. Depth-of-Field Scale: The depth of field is the distance in front of and behind the plane of focus on the subject that appears sharp. The depth of field is indicated by the area between the depth-of-field scale lines below the distance scale. 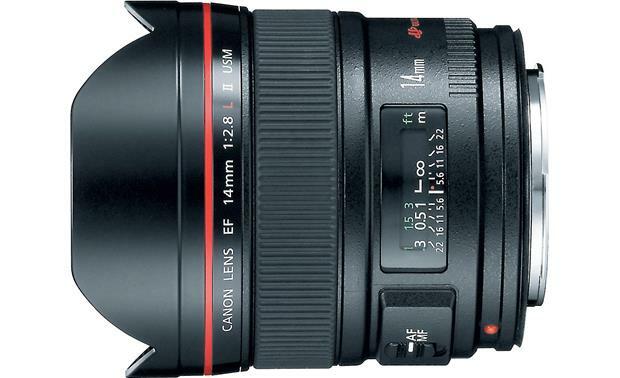 Searches related to the Canon EF 14mm f/2.8L L series ultra-wide-angle prime lens for Canon EOS SLR cameras.